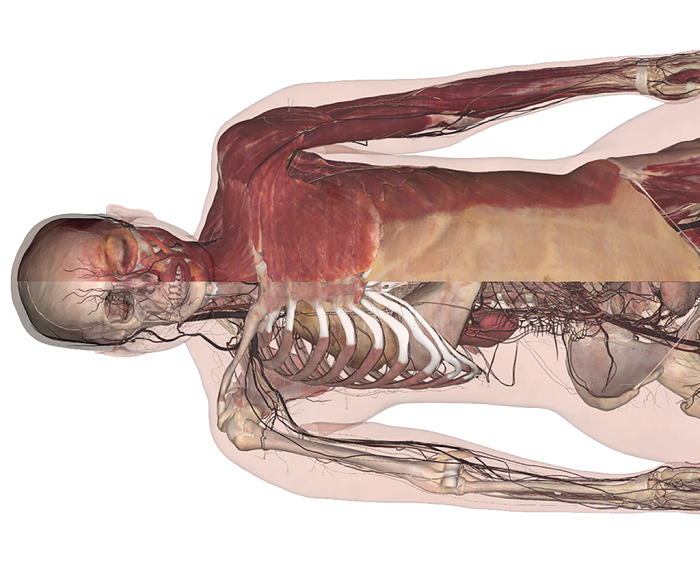 Did you know that the Dana Medical Library has a virtual dissection table called an Anatomage Table? This Table is an advanced visualization system for anatomy education that uses touch screen capabilities. Just recently updated with the latest software, the Table’s screen is designed to fit a life-sized image of the human body. Images can be manipulated to show different anatomical sections with the ability to rotate and view the body or part from all angles. Layers of the body can be removed, certain sections isolated, and cross-sections made, all with pinning, labeling, and color-coding capabilities, among many other functions. Professors and students have the ability to save a manipulated image for teaching purposes, examinations, or presentations. The Table provides curriculum-based tools, import/export capabilities, and an extensive archive of virtual images: full body and regional, CT scans, Histology, and case studies. The Table also has projection capabilities when hooked up to a separate computer and screen system. If you are interested in learning more and exploring the uses of the Anatomage Table, please contact Kate Bright to set up a training session. Trainings show you the basics for use of the Table. Once you receive training, your name will be put on the permission list at Dana’s Main Desk. Then you can drop in and use the Table anytime the library is open and the classroom available. Or you can reserve the room ahead of time by contacting Kate.